Maori graduates have celebrated with whanau and friends at a ceremony to honour their achievements. Fifty-six Maori graduates attended the special ceremony in Palmerston North yesterday, which was also the last in the city for Professor Sir Mason Durie, in his role as Assistant Vice-Chancellor (Maori and Pasifika). A teacher, trustee and former head girl of Manawatu College were among the Massey University graduates who attended. As Natasha Simpson (Ngati Tukorehe), Naomi Tracey Robinson (Ngati Raukawa, Ngati Tuwharetoa, Ngati Kahungunu, Ngati Kauwhata), and Laura Shingleton (Ngai Tahu), crossed the stage, their whanau, friends and students and staff from the school performed waiata tauotoko (songs of support) and haka. Board trustee Tracey Robinson graduated with a Bachelor of Social Work, and former head girl, Laura Shingleton with a Bachelor of Midwifery. Mrs Shingleton helped deliver 62 babies during her studies and now works as a midwife in her hometown, Foxton. She says there was “more love in this one”, as whanau and friends celebrated with graduates. In his final Manawatu graduation address in his role as Assistant Vice-Chancellor (Maori and Pasifika), Sir Mason said the graduates of today had a challenge to ensure that Maori society realised its potential over the next 25 years. "The potential is huge and we need to find a way to realise it," Sir Mason said. "Not only to realise a strong economy – because that's important – but also to realise healthy whanau, healthy lives and healthy young people. "We've spent a lot of time in the past two decades putting out fires. We need to be able to convert our knowledge and education to not only put out fires but to build a strong platform so that fires don't occur. We need strong fences at the top so that we don't have to sit at the bottom with an ambulance. That's what Massey is looking at. Next month we are going to introduce a whanau research programme. It's main aim is to find out what are the ingredients of success for whanau and how to make it happen. "This year also we are working also to develop a new college in this University and the college will be concerned with looking at what are the determinants of health – not what the causes of sickness are but what are the things that make us well and healthy and wealthy; and that enable us to participate fully in the globe as well as to participate fully in te au Maori." 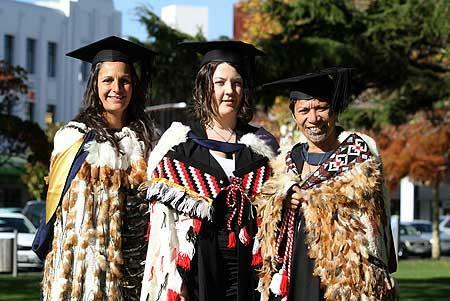 This year there is a total of 396 Maori graduates across all campuses, 34 more than last year. Of that, 149 graduated at Palmerston North ceremonies, including 30 with postgraduate, 111 with undergraduate and eight sub-degree qualifications. A ceremony to honour Pasifika graduates was also held yesterday.